A St. Louis day care center is under fire after a video surfaced showing preschoolers punching each other in what appeared to be a fight club organized by teachers. KTVI-TV obtained video taken at Adventure Learning Center in December 2016. It shows small boys wearing oversized green Incredible Hulk fists punching each other, including in the head. At one point, a teacher jumps up and down in apparent excitement. The only person seen trying to break up a fight is another preschooler. Police and state inspectors investigated. Both teachers were fired but no charges were filed and the center was allowed to remain open. A woman cleared of child abuse charges after bringing a glue gun to school says no one will hire her. NBC 5's Christian Farr has the details. The mothers of two of the children are suing. The case goes to trial in December. Phone calls Wednesday to Adventure Learning Center went unanswered. A woman who answered the phone at another Adventure Learning Center in the St. Louis area declined to comment. The video was captured by the 10-year-old brother of one of the participants, who was in an adjoining room. He sent the video to his mother, who called the center's director. The director stopped the fighting and both teachers were fired. 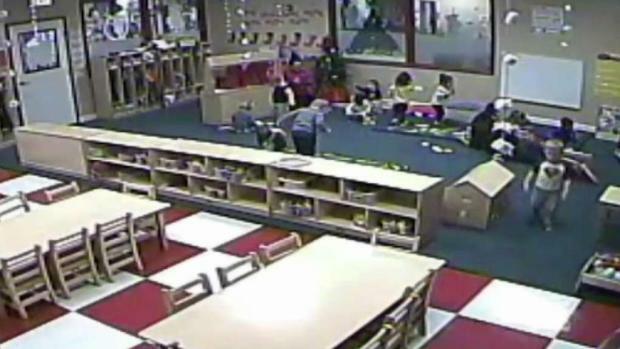 The day care center's own cameras captured more than 30 minutes of fighting, KTVI reported. Circuit Attorney Kim Gardner's office declined to prosecute. A statement on Wednesday cited poor judgment by the adult supervisors but "insufficient evidence to prove beyond a reasonable doubt that any laws were violated." Spokeswoman Susan Ryan said there was no evidence that any of the children were injured. But in the lawsuit filed in January, one of the mothers said her son "continues to suffer injuries to his body, as well as mental anguish." State regulators increased inspections after the incident and follow-up visits found other violations, but nothing that merited closing the center, KTVI reported. A spokeswoman for the Missouri Department of Health and Senior Services did not respond to phone and email messages.